Unfortunately for many older patients, the term “chronic pain” has become a label associated with negative images and stereotypes often linked to long-standing psychiatric problems, futility in treatment, malingering, or drug-seeking behaviors.3 For this reason, the term “persistent pain” is preferred in the medical literature and will be used throughout this article as it may foster a more positive attitude toward pain identification and treatment by both patients and prescribers. Effective pain management in older patients requires physicians to be skillful in the appropriate assessment of pain, possess knowledge and skill related to the appropriate use of pharmacologic and nonpharmacologic interventions, and be aware of the aspects of pain management unique to this population.8 Concerns about drug toxicities, drug interactions, and patients’ fear of treatment are all factors warranting consideration in managing patients’ pain, but these issues do not have to become barriers to effective treatment. The proper assessment of pain in older patients can be quite challenging and requires an appreciation for an atypical presentation in this population. For example, pain can present atypically as delirium, depression, irritability, insomnia, or agitation.11 A comprehensive pain assessment should be performed on any patient presenting with these symptoms. Failure to recognize the atypical presentation of pain may lead to inadequate pain treatment and the use of unnecessary medications for conditions that may be alleviated by appropriately treating pain as the underlying cause. Pain assessment may be particularly difficult in patients with cognitive or speech impairments who are unable to articulate their symptoms. Signs of pain in these patients may include grimacing, unusual focal or aggressive behavior, increased body movement, fluctuating vital signs, changes in sleep or appetite, depression, and worsening cognition.14,15 A variety of pain scales/assessment techniques to address the unique needs of these patients are available. Consistent with pharmacologic therapy for older patients in general, these patients are more likely to experience adverse drug events with various analgesic medications. They are also more likely to have an increased sensitivity to the effect of analgesic agents, especially opiate analgesics.13 Despite these increased risks, analgesics can still be used safely and effectively in patients when age-associated alterations in pharmacokinetics and pharmacodynamics are considered. Changes associated with normal aging may present pharmacological concerns for older patients. Many chronic diseases that are more prevalent among older adults may contribute to these effects. As age progresses, blood flow, hepatic capacity, and renal function all decline and complicate the absorption, distribution, metabolism, and elimination of drugs.16,17 For example, the gastrointestinal absorption of drugs may be affected by slower transit times, prolonging the effects of continuous-release enteral medications. Alternatively, disorders that alter gastric pH may reduce the absorption of some medications. Substantial reductions in hepatic mass, blood flow, and enzymatic capacity (particularly in the cytochrome P450 system) that result from aging can lead to slowed drug metabolism and more pronounced adverse effects in older patients. Older patients with functional impairment or diminished quality of life as a result of pain are candidates for pharmacologic therapy. Treatment decisions should be based on an evaluation of the risk vs. the benefit of individual drug therapies. Carefully considering the characteristics of the chosen analgesic agents and regularly monitoring patients for any potential adverse effects maximizes positive outcomes. Elder patients constitute a heterogeneous population. Optimum analgesic doses and common side effects are difficult to predict. As previously stated, it is best to “start low and go slow” in these situations to optimize pain relief and minimize adverse effects. Always use the least-invasive method of drug administration. The oral route of medication administration is preferred (if possible) to maximize convenience for the patient. For acute, rapidly fluctuating pain, the IV route may be considered, as it provides a more rapid onset and has a shorter duration of action. Subcutaneous and intramuscular routes of administration are also commonly used but may demonstrate larger fluctuations in absorption. For patients with swallowing difficulties, transdermal, rectal, or transmucosal formulations of available medications may be necessary. The timing of medication administration is an important consideration. Analgesics intended for the relief of continuous pain should be administered around the clock to maintain comfort. This can be accomplished with long-acting or sustained-release medication formulations. Short-acting drugs with a more rapid onset of action should also be available for breakthrough pain. Intermittent or episodic pain is usually treated with analgesics prescribed as needed. However, in patients with cognitive impairment who may not be able to report pain or request an analgesic medication, this approach may not be the best choice. Instead, scheduled administration prior to any anticipated pain episodes should be considered. Severe episodic pain requires the use of rapid- and short-acting medications. A combination of pharmacologic and nonpharmacologic treatment strategies may enhance the relief of persistent pain in many patients. Examples of nonpharmacologic measures that have been shown to be effective include physical therapy, cognitive behavioral therapy, and patient/caregiver education. “Rational polypharmacy” may be necessary for patients who do not experience pain relief with monotherapy. A combination of two or more medications with complementary mechanisms of action may be used to optimize pain relief while minimizing the potential for adverse or toxic effects associated with higher doses of a single agent. Because of its relative safety compared with traditional nonsteroidal anti-inflammatory drugs (NSAIDs), acetaminophen is recommended as a first-line therapy for pain. It is effective in the management of both osteoarthritis and lower back pain and is not commonly associated with adverse renal effects, significant gastrointestinal bleeding, or cardiovascular toxicity. Currently, the maximum recommended dose is usually 4 g daily; however, reduced maximum dosages may be considered in older patients, particularly those with hepatic insufficiency or a history of alcohol abuse. Patients and/or caregivers should be educated regarding the maximum recommended dose of acetaminophen due to its availability over the counter (OTC) and its inclusion in many combination products, both prescription and OTC. Acetaminophen may not provide adequate efficacy for persistent pain with an inflammatory component. In these cases, NSAIDs may be considered. However, caution must be used as older patients are at higher risk for several adverse effects of these medications compared with the general adult population. The potential for gastrointestinal toxicity, which increases in frequency and severity with age, is probably the most well-known concern with this medication class. Patients with reduced creatinine clearance, gastropathy, cardiovascular disease, or heart failure also warrant particular caution with use of these agents. The cardiovascular risks associated with NSAIDs are also of concern. Some traditional NSAIDs (eg, ibuprofen) have the potential to interfere with aspirin’s antiplatelet effect. In 2006, the FDA issued a warning regarding the coadministration of aspirin and ibuprofen and the risk of this effect. The cyclooxygenase-2 selective inhibitors rofecoxib and valdecoxib have been withdrawn from the market due to concerns of adverse cardiovascular events; celecoxib is the only agent within this class still available. Differences in risk have also been identified among the traditional agents. Diclofenac may be associated with a higher cardiovascular risk, while several studies indicate that naproxen possesses less cardiovascular toxicity. According to the most recent American Geriatrics Society Panel of the Pharmacological Management of Persistent Pain in Older Persons, “the decision to prescribe NSAIDs in the management of persistent pain in older adults demands individualized consideration.” Decision making regarding treatment with these agents should include a thorough evaluation of patient comorbidities, concomitant medications, and risk factors (eg, cardiovascular, gastrointestinal, renal function, drug-drug interactions). The potential benefits of therapy should always be weighed against the potential risks in individual patients. Opioid analgesic medications act by blocking receptors in the central nervous system (brain and spinal cord), resulting in decreased pain perception. Although older patients may be more sensitive to the analgesic effects of these medications, they remain an important component in the control of moderate to severe pain. Opioid analgesics have no ceiling to their analgesic effects and have been shown to relieve multiple types of pain. Common adverse effects associated with opioid therapy include constipation, nausea and vomiting, sedation, impaired judgment, impaired psychomotor function, and respiratory depression. The tolerability profile of a particular medication is a very important consideration in older patients, as many of these potential effects can result in very serious consequences (eg, falls as a result of dizziness, drowsiness, and/or motor imbalance). As previously discussed, using lower starting doses, longer dosing intervals, and/or slower titration schedules can minimize the risks for some of the potentially adverse effects of opioid analgesics. Constipation is one complication of opioid drugs for which older patients do not develop a tolerance. This effect is important to recognize since it can be effectively prevented and relieved. The management of opioid-induced constipation can include increasing fluid intake and maintaining mobility. For many patients, the use of potent stimulant laxatives such as senna or bisacodyl with or without a stool softener (docusate sodium) is necessary. Impactions should be removed and obstruction ruled out before therapy with a stimulant laxative is initiated. The adverse effect profile can also vary significantly among opioid analgesics; therefore, medications with a more favorable tolerability profile (especially regarding central nervous system and gastrointestinal effects) should be chosen for elder patients. Pentazocine should also be avoided in older patients because it is associated with increased delirium and confusion in this population. Meperidine can cause delirium seizures, dysphoria, and myoclonus secondary to accumulations of the metabolite normeperidine, which is more common in those with poor renal function. Regardless of the opioid agent chosen, patients should receive continuous and ongoing monitoring for efficacy and the occurrence and intensity of opioid-related adverse effects. Pain is common in older patients, often presents atypically, and can lead to the development of additional symptoms and conditions if unrecognized, untreated, or undertreated. All physicians have a responsibility to ensure a better quality of life for elder patients who are experiencing pain. Pharmacologic therapy should be adjusted based on the potential for age-associated alterations in pharmacodynamic and pharmacokinetic parameters, and ongoing monitoring should be performed for all patients receiving analgesic medications to assess for efficacy, safety, and tolerability on an individualized basis. Turk DC, Okifuji A. Pain terms and taxonomies of pain. In: Loeser JD, Butler SH, Chapman CR, Turk DC (eds). Bonica’s Management of Pain. 3rd ed. Philadelphia: Lippincott Williams & Wilkins; 2001:17-25. Whitecar PS. Pharmacotherapy issues of managing chronic pain in the geriatric population. In: Olsen CG, Tindall WN, Clasen ME (eds). Geriatric Pharmacotherapy: A Guide for the Helping Professional. American Pharmacists Association; 2006:193-213. Ferrel BA, Chodosh J. Pain management. In: Hazzard WR, Blass JP, Halter JB, Ouslander JG, Tinetti ME. Principles of Geriatric Medicine & Gerontology. 5th ed. McGraw-Hill Companies; 2003:303-321. Herr KA, Garand L. Assessment and measurement of pain in older adults. Clin Geriatr Med. 2001;17(3):457-478. AGS Panel on Persistent Pain in Older Persons. The management of persistent pain in older persons. J Am Geriatr Soc. 2002;50(6 Suppl):S205-224. Weiner DK, Rudy TE, Morrow L, Slaboda J, Lieber S. The relationship between pain, neuropsychological performance, and physical function in community-dwelling older adults with chronic low back pain. Pain Med. 2006;7(1):60-70. Ferrell BA. The management of pain in long-term care. Clin J Pain. 2004;20(4):240-243. The management of chronic pain in older persons: AGS Panel on Chronic Pain in Older Persons. American Geriatrics Society. J Am Geriatr Soc. 1998;46(5):635-651. Kane RL, Ouslander JG, Abrass I. Essentials of Clinical Geriatrics. 5th ed. New York: McGraw-Hill Companies; 2003. American Geriatrics Society Panel on the Pharmacological Management of Persistent Pain in Older Persons. The management of persistent pain in older persons. J Am Geriatr Soc. 2009;57(8):1331-1346. Molony SL, Kobayashi M, Holleran EA, Mezey M. Assessing pain as a fifth vital sign in long-term care facilities: Recommendations from the field. J Gerontol Nurs. 2005;31(3):16-24. Ferrell BA. Pain evaluation and management in the nursing home. Ann Intern Med. 1995;123(9):681-687. Cavalieri TA. 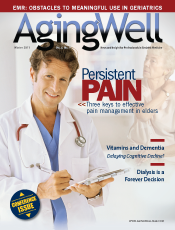 Pain management in the elderly. J Am Osteopath Assoc. 2002;102(9):481-485. Davis MP, Srivastava M. Demographics, assessment and management of pain in the elderly. Drugs Aging. 2003;20(1):23-57. Sleeper RB. Geriatric primer — Common geriatric syndromes and special problems. Consult Pharm. 2009;24(6):447-462. Robinson P. Pharmacological management of pain in older persons. Consult Pharm. 2010;25 Suppl A:11-19. Hutt E, Pepper GA, Vojir C, Fink R, Jones KR. Assessing the appropriateness of pain medication prescribing practices in nursing homes. J Am Geriatr Soc. 2006;54(2):231-239. Older patients are more likely to experience adverse reactions or sensitivities to analgesic medications. Inadequate assessment strategies result in inadequate pain management. Inadequately treated pain frequently leads to other problems, including depression, anxiety, sleep disorders, decreased quality of life, and reduced independence. The American Geriatrics Society recommends that all elder patients be assessed for evidence of persistent pain upon initial presentation. A comprehensive history and physical examination are essential components in pain assessment and evaluation. A combination of pharmacologic and nonpharmacologic treatment strategies may enhance the relief of persistent pain in many patients.